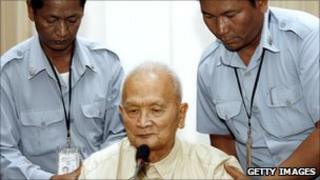 Three of the most senior surviving leaders of the Khmer Rouge have appeared in court in Cambodia. Nuon Chea, Ieng Thirith and Khieu Samphan attended a hearing at the UN-backed war crimes tribunal to request release from pre-trial detention. They and another senior figure face charges of genocide for their roles in the deaths of about two million Cambodians between 1975 and 1979. The elderly defendants have all been in detention since 2007. Nuon Chea was the second-in-command to the Khmer Rouge leader, Pol Pot, and is accused of devising the policies which led to the deaths of hundreds of thousands of people. The 84-year-old, who was known as Brother Number Two, argued that the Tribunal had no right to extend his pre-trial detention. Similar points were made by the former head of state, Khieu Samphan, and ex-social affairs minister, Ieng Thirith, who excused herself and left a written statement. The BBC's Guy De Launey in Phnom Penh says it would be a surprise if their appeals were successful, and they will probably spend several more months in detention before the start of their trial for genocide. A date for the trial has not yet been set, although it is scheduled to begin by the middle of 2011. The fourth ex-leader is Ieng Thirith's husband Ieng Sary, who was the Khmer Rouge foreign minister. His lawyers filed a request several weeks ago for the 85-year-old's tribunal hearings to be limited to half-day sessions due to his fragile health. The tribunal - officially called the Extraordinary Chambers in the Courts of Cambodia - was set up in 2006 but so far it has only tried one person. Former prison chief Comrade Duch was found guilty last July of crimes against humanity. The tribunal's financial difficulties have been eased a little by a donation from Japan, which last week pledged $11.7m (£7.4m) to fund court operations in 2011. But our correspondent says the question of how to fund a trial which may last as long as three years still has not been answered.